This Marbles 5 light LED globe multi-drop pendant in polished chrome with crushed ice shades looks modern and stylish in any bedroom, living room, dining room or kitchen. Featuring a circular ceiling mount and five lights hanging at different heights on fine wires, boasting globe shades that have half crushed ice effect and chrome top for a diffused light. 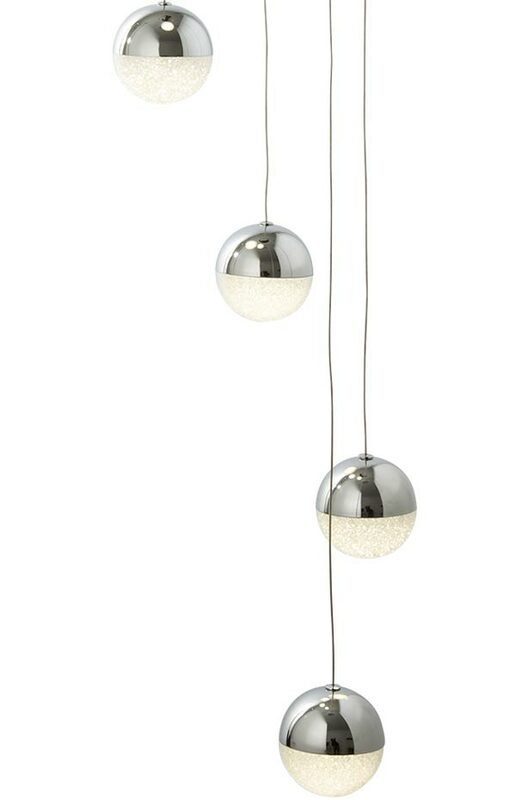 Now you can create contemporary appeal using this distinctive five globe dingle-dangle pendant ceiling light. Suspended by delicate silver wires, the mix of crushed ice effect and chrome creates a stylish look. This would look perfect suspended from a high ceiling in a contemporary home, over a kitchen table, breakfast bar or dining table. There are matching fittings available in the Marbles LED pendant range that include an eight light multi-drop and single pendant lights; please see below. Supplied by Searchlight who manufacture some of the best traditional and modern classic designs such as the Marbles 5 light LED globe multi-drop pendant in polished chrome with crushed ice shades you see here.